Question 1: Mr. President, we’ve been to Aleppo, we’ve seen the destruction, how do you see the way forward to peace nowadays after Astana? President Assad: If you want to talk about how to see the peace, it’s not related mainly to Astana; it’s related to something much bigger: how can we stop the flowing of the terrorists toward Syria, or in Syria, how can we stop the support from regional countries like Turkey, Gulf states, or from Europe like France and UK, or from the US during the Obama administration. If we deal with that title, this is where you can talk about the rest, about the political procedure. Astana is one of the initiatives during this war on Syria, and it’s about the dialogue between the Syrians. Now it’s too early to judge Astana, the first one was positive because it was about the principles of the unity of Syria, about the Syrians deciding their future. How can you implement this communique? That’s the question, and I think we are going to see Astana 2 and so on. So, the peace is two things: fighting terrorists and terrorism, stopping the flowing of terrorism, every kind of logistical support. Second, dialogue between the Syrians to decide the future of their country and the whole political system. These are the headlines about how we see the future of Syria. Question 2: We have seen many breaches in the ceasefire, would you consider the ceasefire is still upholding, or is it dead? President Assad: No, it’s not dead, and it’s natural in every ceasefire anywhere in the world, in every war, in any conflict, to have these breaches. It could be sometimes on individual levels, it doesn’t mean there’s policy of breaching the ceasefire by the government or by any other party, and this is something we can deal with on daily basis, and sometimes on hourly basis, but till this moment, no, the ceasefire is holding. Question 3: In the fight against terror group Daesh, do you think all means are justified? President Assad: Yeah, but I don’t know what the means that are available to tell you yes or “all means,” so I don’t what the “all means” are. But if you want to talk about military means, yes of course, because the terrorists are attacking the people – I’m not only talking about ISIS; ISIS and al-Nusra and all the Al Qaeda-affiliated groups within Syria – when they are attacking civilians, and killing civilians, and beheading people, and destroying properties, private and public, and destroying the infrastructure, everything in this country, let’s say, our constitutional duty and legal duty as government and as army and as state institutions is to defend the Syrian people. It’s not an opinion; it’s a duty. So, regarding this, you can use every mean in order to defend the Syrian people. Question 4: But we have seen the destruction in Aleppo, you have seen the images as well. Was there no other way to do it? 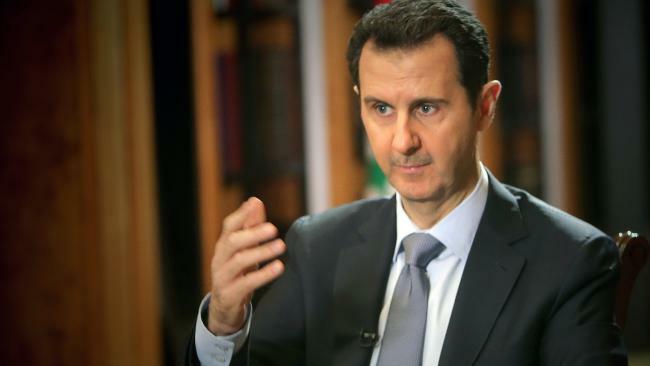 President Assad: Actually, since the beginning of the crisis, of the war on Syria, we used every possible way. We didn’t leave any stone unturned in order to bring people to the negotiating table, but when you talk about the terrorists, when you talk about terrorists, when you talk about Al Qaeda, when you talk about al-Nusra and ISIS, I don’t think anyone in this world would believe that they are ready for dialogue, and they always say they’re not; they have their own ideology, they have their own way path, they don’t accept anything that could be related to civil state or civil country, they don’t, and I think you know as a European about this reality. So, no, making dialogue with al-Nusra and Al Qaeda is not one of the means, but if somebody wanted to change his course on the individual levels, we are ready to accept him as a government, and give him amnesty when he goes back to the normal life and gives up his armament. Question 5: The Belgian government is contributing in the fight against Daesh. There are six F-16 fighter planes in the fight against Daesh. Are you grateful to the Belgian government for that contribution? President Assad: Let me be frank with you, when you talk about contribution in the operation against ISIS, actually there was no operation against ISIS; it was a cosmetic operation, if you want to talk about the American alliance against ISIS. It was only an illusive alliance, because ISIS was expanding during that operation. At the same time, that operation is an illegal operation because it happened without consulting with or taking the permission of the Syrian government, which is the legitimate government, and it’s a breaching of our sovereignty. Third, they didn’t prevent any Syrian citizen from being killed by ISIS, so what to be grateful for? To be frank, no. Question 6: You have stated several times that it is up to the Syrian people, it is up to the constitution, to decide who their leadership should be, who their president should be. If the Syrian people would decide for a new leadership, would you consider to step aside? President Assad: If the Syrian people choose another president, I don’t have to choose to be aside; I would be aside, I would be outside this position, that’s self-evident, because the constitution will put the president, and the constitution will take him out according to the ballot box and the decision of the Syrian people. Of course, that’s very natural, not only because of the ballot box; because if you don’t have public support, you cannot achieve anything in Syria, especially in a war. In a war, what you need, the most important thing is to have public support in order to restore your country, to restore the stability and security. Without it, you cannot achieve anything. So, yes, of course. President Assad: Of course, we don’t own the country, my family doesn’t own the country, to say that only Assad should be in that position, that’s self-evident, and this could be by coincidence, because President Assad didn’t have an heir in the institution to be his successor. He died, I was elected, he didn’t have anything to do with my election. When he was president, I didn’t have any position in the government. If he wanted me to be an heir, he would have put me somewhere, gave me a responsibility, I didn’t have any responsibility, actually. So, it’s not as many in the media in the West used to say since my election, that “he succeeded his father” or “his father put him in that position.” So, yes, Syria is owned by the Syrians, and every Syrian citizen has the right to be in that position. Question 8: Do you think the European Union or even NATO can play a role in, like, rebuilding the country, like, rebuilding Syria? President Assad: You cannot play that role while you are destroying Syria, because the EU is supporting the terrorists in Syria from the very beginning under different titles: humanitarians, moderate, and so on. Actually, they were supporting al-Nusra and ISIS from the very beginning, they were extremists from the very beginning. So, they cannot destroy and build at the same time. First of all, they have to take a very clear position regarding the sovereignty of Syria, stop supporting the terrorists. This is where the Syrians would – I say would – accept those countries to play a role in that regard. But in the meantime, if you ask any Syrian the same question, he will tell you “no, we don’t accept, those countries supported the people who destroyed our country, we don’t want them to be here.” That’s what I think. Question 9: Do you think Belgium can play a role in Syria? President Assad: Let me talk about the European political position in general; many in this region believe that the Europeans don’t exist politically, they only follow the master which is the Americans. So, the question should be about the Americans, and the Europeans will follow and will implement what the Americans want. They don’t exist as independent states, and Belgium is part of the EU. Question 10: There is a new administration in Washington, with Trump in power. What do you expect from it? Are you looking to work closely together? President Assad: What we heard as statements by Trump during the campaign and after the campaign is promising regarding the priority of fighting terrorists, and mainly ISIS, that’s what we’ve been asking for during the last six years. So, I think this is promising, we have to wait, it’s still early to expect anything practical. It could be about the cooperation between the US and Russia, that we think is going to be positive for the rest of the world, including Syria. So, as I said, it’s still early to judge it. Question 11: If you look back on the last couple of years, are there any things that you regret? Journalist: Have you made mistakes? President Assad: As a human, I have to make mistakes to be human. Otherwise, I’m not a human. Journalist: What would you consider a mistake? President Assad: A mistake is when you either take a wrong decision or make a wrong practice, it depends on the situation. But if you want to talk about the crisis, as I understand from the question, the three decisions that we took from the very beginning is to fight terrorism, and I think it’s correct, is to make dialogue between the Syrians, I think it’s correct, to respond to every political initiative, whether it’s genuine or not, and I think it’s correct, and actually we supported the reconciliation between the Syrians, and I think it’s correct. Anything else could be trivial, so you have a lot of things regarding the practice, regarding the institutions, you always have mistakes. Question 12: If you look back, was this war avoidable? President Assad: No, because there was bad intention regarding the different countries like Saudi Arabia, Qatar, Turkey, France, UK, and the US in order to destabilize Syria, so it wasn’t about the Syrians. That doesn’t mean that we don’t have many flaws before the war and today as a country that allow many of those countries to mess with our country. I’m not excluding, I’m not saying it’s only about them, but they were the one who took the initiative in order to wage this war, so I don’t think it was avoidable. Question 13: You have just had a visit from a Belgian parliamentary delegation with Mr. Dewinter and Mr. Carcaci, do you consider them as friends? President Assad: The most important thing about those visits is not to be friends with them. As a politician, you don’t come to Syria to visit your friend; you come to Syria to see what’s going on. Journalist: Do you see them as political allies? President Assad: No, they’re not my allies at all. They are coming here not for that reason; they are here in order to see what’s going on. They are the allies of the Belgian people. They came here because the government, the Belgian government, like many European governments, are blind today, they have no relation with this country on every level, so they don’t see what’s going on, they cannot play any role. So, now the only eyes that you have are the delegations that are coming from your country, and this is one of them, this is one of the eyes that your government could have, and you could have many other eyes and delegations coming to Syria. So, they’re not my allies, they’re not coming here for me; they’re coming here to see the situation, and I’m one of the players in the Syrian conflict, it’s natural to meet with me to hear what’s my point of view. Question 14: Mr. President, just one more question: after the victories in Aleppo, Wadi Barada, your troops are close from al-Bab, do you think that all these major victories can change the mind of European governments concerning the Syrian government? President Assad: I don’t know, I think they have to answer that question. For us, it’s our war, we need to liberate every single inch on the Syrian territory from those terrorists. If the European governments think that their efforts went in vain, that’s good, they may change their mind, and at least to stop supporting those terrorists that don’t have the support of the public in Syria; they only have the support of the Europeans and the Gulf states, the Wahabi Gulf states, in order to have more terrorism and extremism in Syria. We hope, I think during the last two years, the whole world has changed, the United States has changed, the situation in Syria has changed, the situation in the region in general has changed. Two things didn’t change or hasn’t changed till this moment: first of all, Al Qaeda is still there through ISIS and al-Nusra, and the mentality of the European officials, it hasn’t change yet, they live in the past. Question 15: Mr. President, in your opinion, what is our ______ to question if after the war, the international court in the Hague should go over some responsibles on the crimes against humanity against the Syrian people, do you support that view, that the responsibles of the crimes at war should be judged by the international court in the Hague? President Assad: We all know that the United Nations institutions are not unbiased, they are biased, because of the American influence and the French and British, mainly. So, most of those institutions, they don’t work to bring the stability to the world or to look for the truth; they are only politicized to implement the agenda of those countries. For me, as president, when I do my duty, the same for the government and for the army, to defend our country, we don’t look to this issue, we don’t care about it. We have to defend our country by every mean, and when we have to defend it by every mean, we don’t care about this court, or any other international institution. Question 16: Yes. Do you accept the position of the United Nations? President Assad: It depends on that position. Most of the positions are biased, as I said, regarding every organization, regarding every sector, regarding most of the resolutions against Syria. That’s why it was for the first time maybe for Russia and China to take so many vetoes in few years, because they know this reality. So, no, we don’t accept, we don’t accept.